Nearly one in seven Germans suffer from an anxiety disorder. Some panic upon boarding an aircraft, others find it impossible to enter a room with a spider on the wall and again others prefer the staircase over the elevator – even to get to the tenth floor – because riding in elevators elevates their heart rate. What sounds like funny anecdotes is often debilitating for the sufferers. Sometimes their anxiety can affect them to a point that they are unable to follow a normal daily routine. But help is available: "Cognitive behavioural therapy is an excellent treatment option," says Professor Martin J. Herrmann, a psychologist at the Center of Mental Health of the Würzburg University Hospital. This form of therapy deliberately exposes anxiety patients to the situations they feel threatened by – under the individual psychological supervision of an expert. However, current studies have shown that this type of intervention does not benefit all persons in equal measure. This is why Herrmann and researchers from the Department of Clinical Psychology of the University of Würzburg have been looking for ways to improve the patients' response to cognitive behavioural therapy – by using the so-called transcranial magnetic stimulation. In fact, a positive effect was found on the study participants treated with this method. "We knew from previous studies that a specific region in the frontal lobe of the human brain is important for unlearning anxiety," Martin J. Herrmann explains the work of the Würzburg scientists. He goes on to say that initial studies have shown that magnetically stimulating this brain region can improve the effectiveness of unlearning anxiety responses in the laboratory. In its recently published study, the team investigated whether this also works for treating a fear of heights. 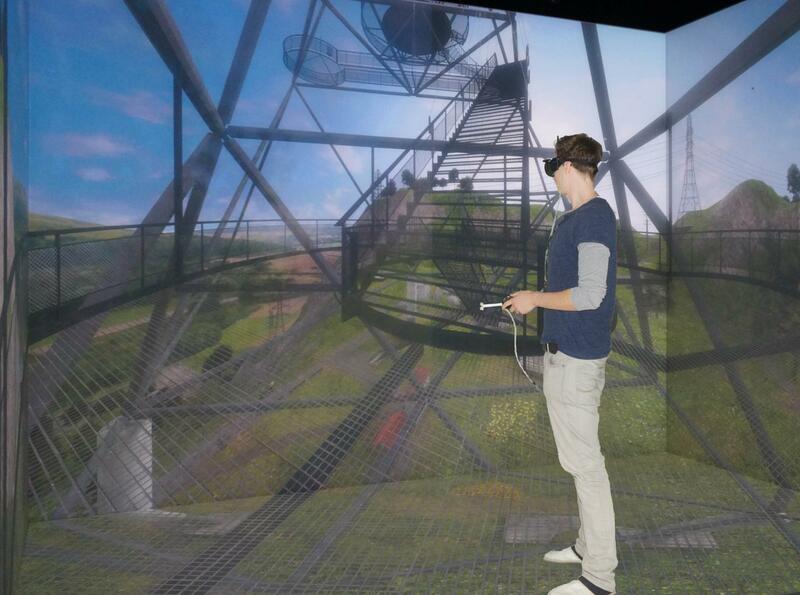 To this end, 39 participants with a pronounced fear of heights were taken to dizzying heights during two sessions – however not in real life but using virtual reality. It does not matter that the environment is not real: "The people feel actual fear also in a virtual reality – although they know that they are not really in a dangerous situation," Herrmann explains. The scientists stimulated the frontal lobe of some of the anxiety patients for about 20 minutes before entering the virtual world; the other group was only administered a pseudo stimulation. The result: "The findings demonstrate that all participants benefit considerably from the therapy in virtual reality and the positive effects of the intervention are still clearly visible even after three months," Herrmann explains. And what is more: By stimulating the frontal lobe, the therapy response is accelerated. Next the researchers want to study whether this method is also suitable to treat other forms of anxiety by conducting a further virtual reality therapy study for arachnophobic patients. The study was performed within the scope of Collaborative Research Center / Transregio 58 "Fear, Anxiety and Anxiety Disorders". During transcranial magnetic stimulation (TMS), a magnetic coil is placed near the head of the person receiving the treatment. The coil produces a rapidly changing magnetic field which sends magnetic pulses through the cranium into the brain. There it triggers an action potential in the neurons and the neuron transmits an impulse. Although the technique has been around for a few decades only, it is routinely used in research and diagnostics.